For Doers... 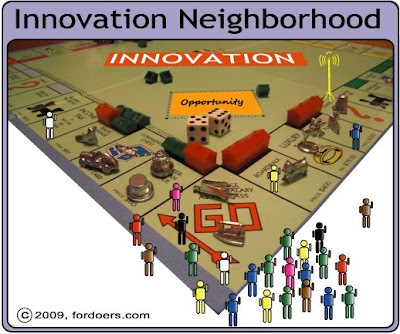 Innovation Culture for Delighting Customers: What makes a great neighborhood? Can this be a model for Innovation? What makes a great neighborhood? Can this be a model for Innovation? We have all experienced it, felt it, and seen it firsthand. Others around us have too. And when we don’t have a great neighborhoods we certainly feel that too. Perhaps we pass through quickly, or stay cooped up for safety sake or just retreat to more sanguine surrounding, be it couch, TV, book, or bed. Great neighborhoods have common areas frequented by people with spirited purpose. Pool, library, garden, coffee shop , grocery store, or front yard – it really doesn’t matter. These purpose felt people have a feeling of opportunity and venture out in the world to make things happen. They have the confidence they can learn from or share with those around them. Eye contact isn’t at all strange in a great neighborhood. There is no fear. Safety and security are nigh thought of; there simply isn’t any need. A great neighborhood doesn’t operate at a base level, it has the luxury of having evolved to the higher order of Maslow’s hierarchy of needs. Those in trouble are spotted by caring neighbors who assemble to lend a hand. Great neighborhoods are not locked in time. They don’t rest on their laurels. Though things mature, there is rebirth and trimming; the hedges and gardens don’t feel overgrown and unwelcome. People know which direction to go, there are sidewalks and signs. There are guidelines, rules to promote peaceful coexistence and harmony among a diverse range of people of varying ethnicity, age, income, and health. People are at all different stages of development and ability. The community recognizes this and even puts in sidewalks that are accessible to those bound to scooters, walkers and wheelchairs. People help people, nobody is hungry for very long and there is at least one person a bit “out there” to challenge our “old comfortable” ways of thinking. There is an absence of broken windows and graffiti. Neighbors in great neighborhoods keep up appearances but not artificially. It feels very authentic. Great neighborhoods have high levels of trust and pull through challenging situations from weathering the storm to planning the annual block party. People in great neighborhoods naturally harness the wisdom of crowds and embrace diverse creative thinking. There is a focus on delighting others, especially by those children less hardened by the world. Though you never count on it you often welcome seasonal changes by the handmade holiday card, the special basket of may flowers, or “boo” package that you receive from clandestine snickerers. People are not afraid to frequent their front yards for those are where new contacts are made and old friendships refreshed. There is a healthy balance of privacy and transparency without upsetting surprises. People in great neighborhoods don’t care about hierarchy. Everything is contextual. Everybody leads and everybody follows. The kid selling lemonade is the leader for the day, bringing delight to others. Business leaders can learn something from the uncommon but familiar study of a great neighborhood. Our increasingly diverse, interdependent, global , and dynamic work environments demands that we too, operate like a great neighborhood, an Innovation Neighborhood. Ignore the neighborhood and you’re leaving much to chance, a prescription for broken window syndrome and ultimately broken innovation.